Pope Francis has suffered a setback as proposals for wider acceptance of gay people failed to win a two-thirds majority at the Synod, with paragraphs in a draft document stripped from the final text, reports the BBC. 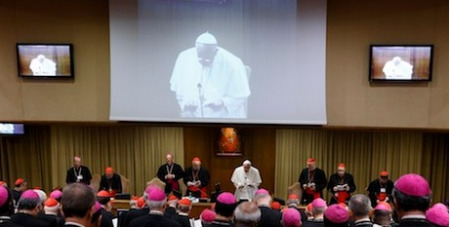 The draft issued half-way through the meeting of bishops had called for greater openness towards homosexuals, and divorced Catholics who have remarried. It said that homosexuals had "gifts and qualities to offer to the Christian community" but the revised document only said that discrimination against gay people "is to be avoided". All other parts of the draft report were accepted by the Synod. The Pope said the full draft document, including the rejected paragraphs, should nonetheless be published. Correspondents say the text welcoming gay people and remarried Catholics had been watered down in the final version that was voted on - but it appears that they still met with resistance from conservatives. Speaking after the vote, Pope Francis told attendees that he would have been "worried and saddened" if there had not been "animated discussions" or if "everyone had been in agreement or silent in a false and acquiescent peace", AP news agency reported. He also cautioned against "hostile rigidity, that is the willingness to close oneself inside the written word instead of letting God surprise us".